The concept behind Italian cuisine is very easy. This light and refreshing simple salad recipe is the perfect example of this concept. The combination of fresh pungent greens with the natural fresh sweetness of fruit, topped with the rich creamy texture of nuts and a salty cheese all drizzled with the best extra virgin olive oil and a squirt of lemon juice will leave you speechless. Let’s take a moment to discover a few of these ingredients and highlight some of their qualities. Did you know that arugula is actually a herb? Despite the fact that it is often characterized as the lettuce with personality, arugula is actually a member of the mustard family, brassicaceae, which includes broccoli, cabbage, and kale. 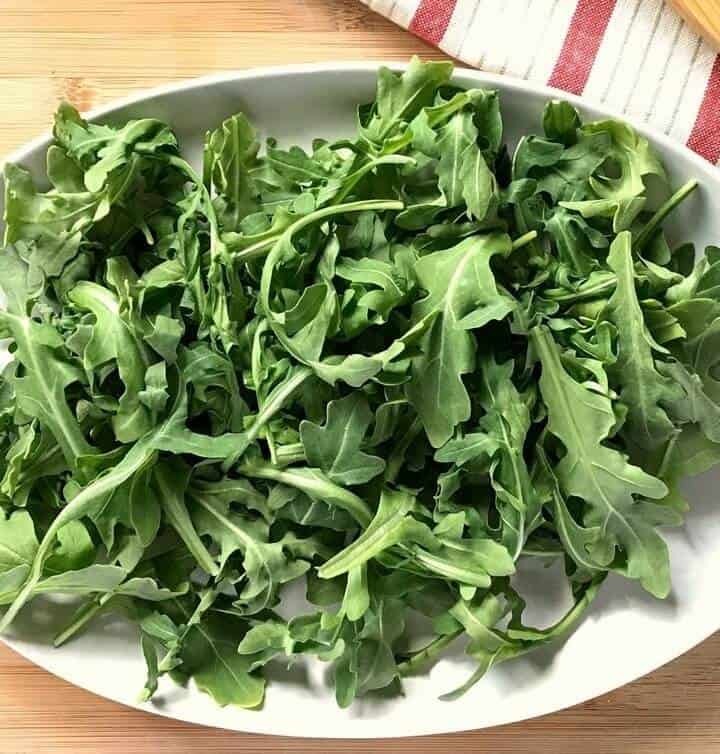 Arugula, also referred to as garden rocket, roquette, rucola or rugula (to name but a few) is an annual herb with lobular, elongated green leaves. 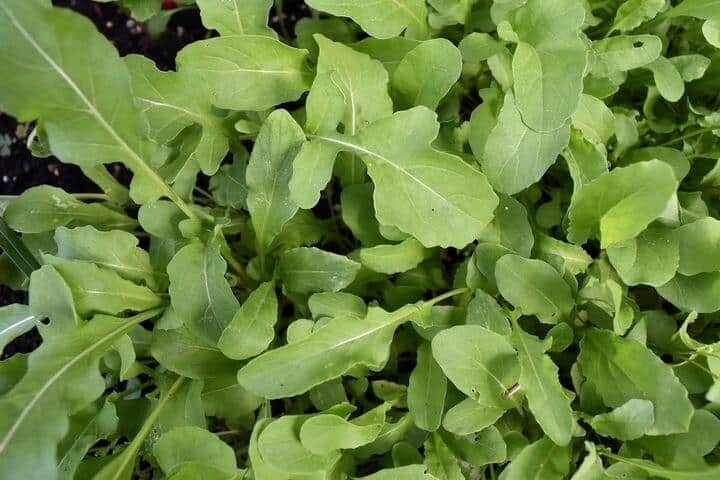 Arugula is extremely easy to grow and can be harvested within forty days of sowing the seeds. Keep in mind that the bitterness is more pronounced as the plant matures. Here’s a great video that will take you through the whole process of planting, caring and harvesting your arugula. I’ve also included a few tips on buying and storing arugula in case gardening is not for you. How do you Choose and Store Arugula? keep arugula refrigerated and enjoy within 2-3 days of purchasing for maximal freshness. What are the Nutritional Benefits of arugula? One cup of arugula has only 5 calories and is a great source of Vitamins A, K and the B-vitamin, folic acid. 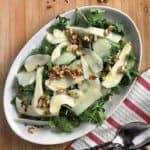 Can arugula be replaced in this Pear Arugula Salad? The versatility of pears make them the perfect ingredient in both sweet and savory dishes. They are available year round and usually hit the farmer’s markets in late summer and early fall. 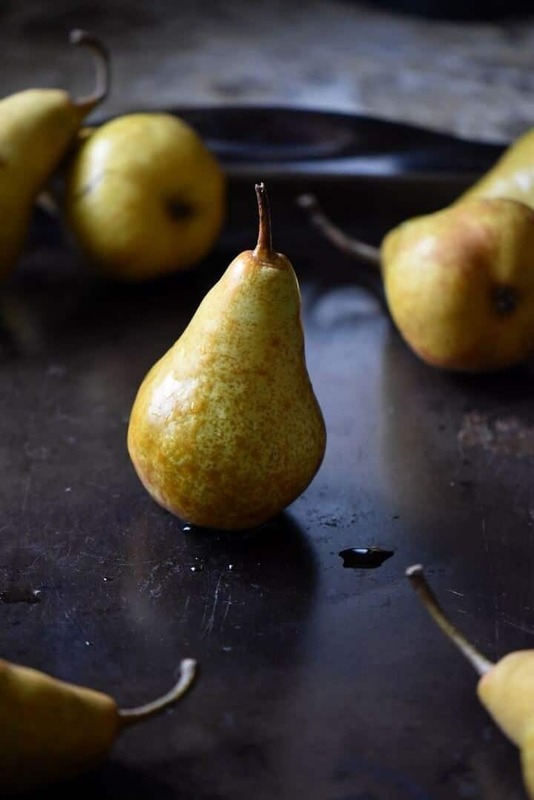 Certain types of pears are great for cooking, while others are best when eaten raw. There are also some varieties that can be consumed cooked or raw. Because of this variability, pears can be baked, broiled, poached or even grilled. Needless to say, there really is nothing better than biting into a sweet, juicy ripe pear! How do you Choose and Store Pears? leave at room temperature to ripen. Here is a great little video to test for pear ripeness. 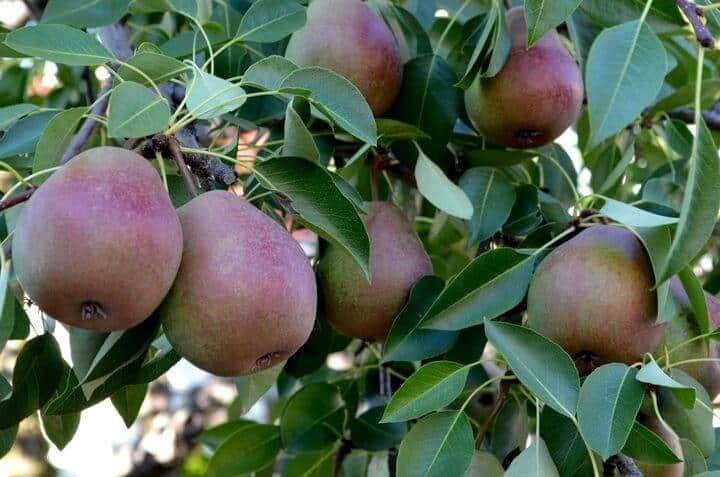 What are the Nutritional Benefits of pears? One medium pear provides approximately 5.5 grams of fiber and contains a healthy amount of Vitamin C, potassium and phytochemicals. All of this for only 100 calories. Fresh walnuts have a bittersweet flavor and are equally delicious in sweet or savory dishes. They also make a nutritious snack on their own. They can be purchased shelled (available whole, chopped, ground) or unshelled. Walnuts are harvested in the fall, when the hulls split open and the walnuts naturally fall to the ground. How do you Choose and Store Walnuts? walnuts with the shell can be stored at room temperature for a couple of weeks. 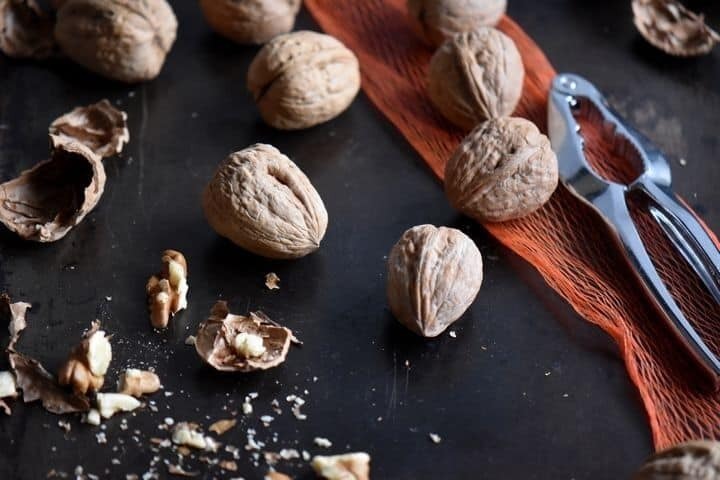 What are the Nutritional Benefits of walnuts? As you probably know, most nuts are heart healthy foods. Walnuts are no exception. In fact, they are the only nuts that provide a high amount of omega 3 fatty acids. A mere ounce will provide you with 4 grams of protein and about 2 grams of fiber along with B complex vitamins, magnesium, calcium and phosphorous. Now that you know a little bit more about these wonderful ingredients, are we ready to have some fun? Let’s begin by toasting the walnuts. Toasting walnuts (or any nuts) not only improves their taste and aroma, but also increases the crunchiness of the nut. So if you are wondering whether or not you should skip this step…. don’t. Your taste buds will thank you! Here’s how to toast walnuts in your oven -simply scatter them on a baking sheet and place in a 350 degree oven for about 8-10 minutes. Make sure to give them a shake every once in a while. Once they are done, remove from the oven, transfer to a plate and allow to cool off. In the meanwhile, we can get the rest of the ingredients ready to make the best arugula salad. Let’s start with the arugula. Once rinsed and spun dry, place the arugula in a large shallow plate. Set it aside while we slice the pears. Once the pears are thoroughly washed, halve and core them. Then, with a very sharp knife, slice them thinly. Feel free to remove the skins if they are tough. Have you ever wondered why pears brown quickly once they are cut open? Some simple chemistry is the answer. The fact is that pears (just like bananas, apples, peaches and potatoes) contain an enzyme called tyrosinase. As soon as there is exposure to oxygen, there is a chemical reaction that occurs and the end result is a visible browning on the pear. applying an acid on the cut surface. So for our arugula salad recipe, the thinly sliced pears are placed in a small bowl with some lemon juice. This will preserve their color while we get the rest of the ingredients ready. By this time, the walnuts should have cooled off, give them a quick chop and let’s start making the salad. 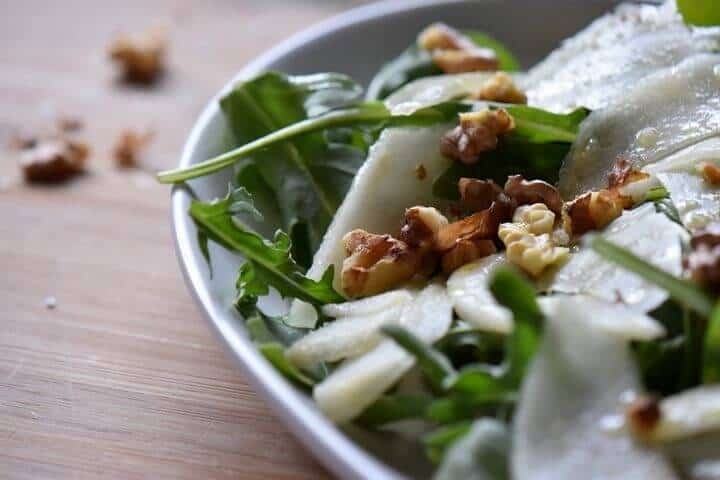 Scatter the pear slices on top of the arugula; followed by some Parmesan shavings and a sprinkle of walnuts. Finally, drizzle with some extra virgin olive oil, a few squirts of lemon juice and enjoy! 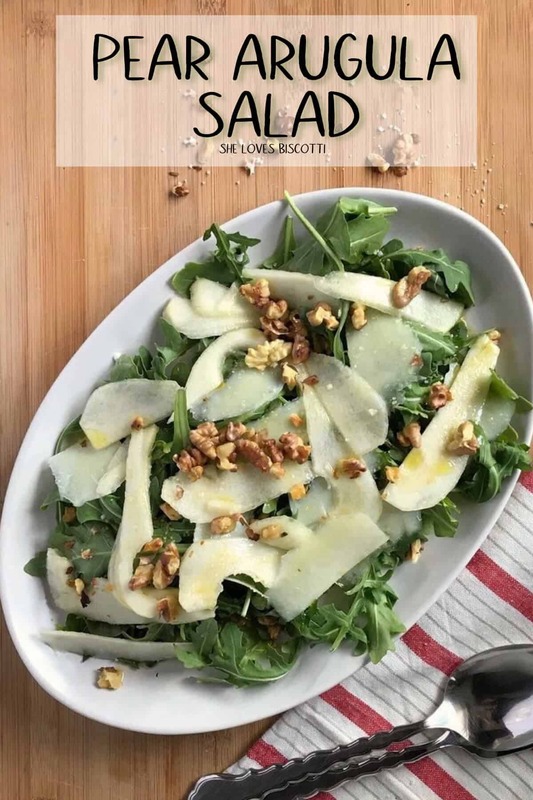 If you like Italian food, you know that this Pear Arugula Salad (or a variation of) can often be found on the menu in so many Italian restaurants. It simply is a question of balancing out the flavors and as you can see, the ingredients are simply layered in a large shallow serving dish. The wonderful thing about this salad is that it can easily be replicated at home with some of your favorite ingredients. Do you have a favorite arugula combination? 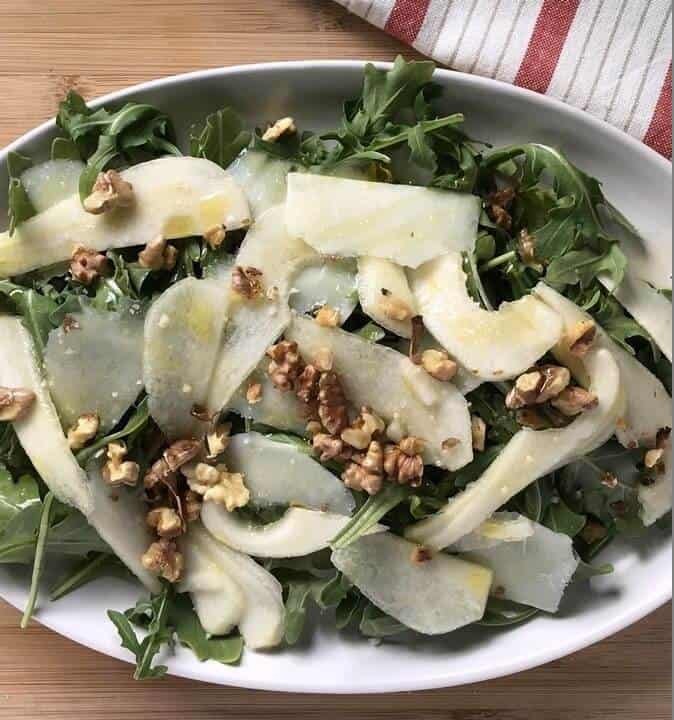 ★★★★★ If you have made this Pear Arugula Salad recipe, I would love to hear about it in the comments below and be sure to rate the recipe! 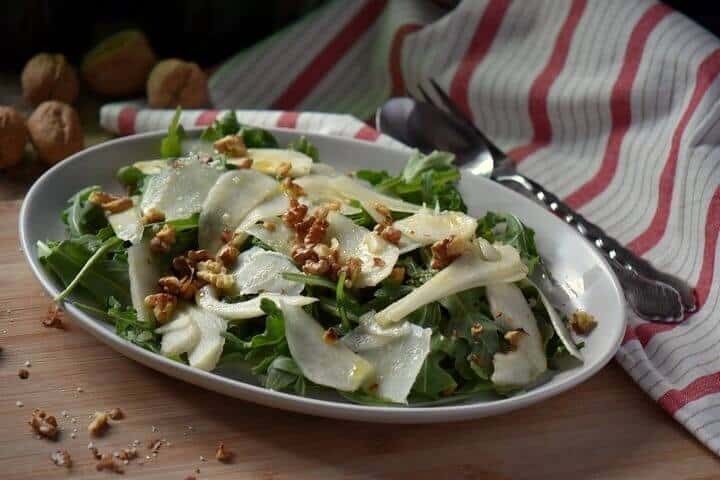 This Pear Arugula Salad is truly a classic Italian salad. 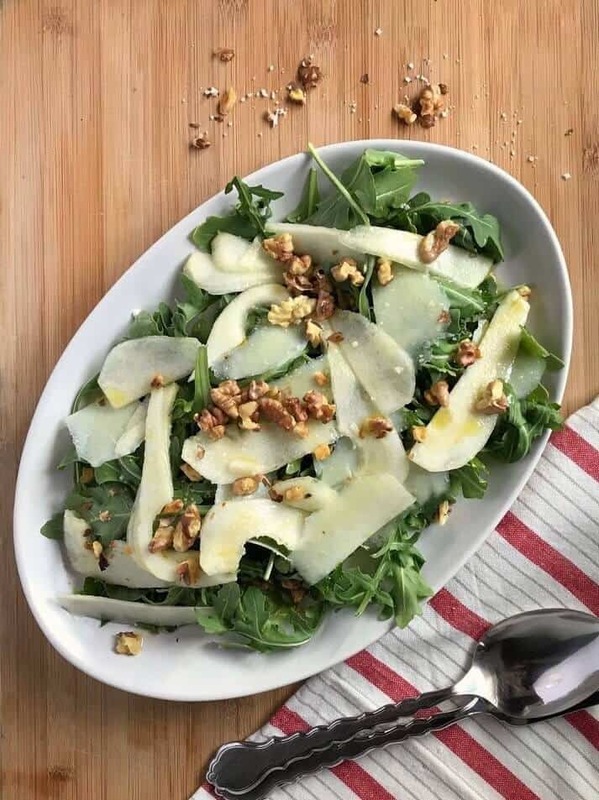 The complementary flavors of peppery arugula, sweet juicy pears, creamy walnuts and salty Parmesan cheese create such an explosion of flavors! You'll love this salad even if you don't like arugula. Halve and core the pears. Slice thinly and place in a bowl along with the lemon juice. Set aside. Place the arugula in a large platter or bowl. Add the Parmesan shavings, the pears and the toasted walnuts. The perfect combination of peppery greens, savory cheese and the distinctive flavor of one of my favorite fruits. Simply dressed with good quality olive oil, this makes a wonderful dinner or lunch as well. I love the Italian concept of fresh, quality ingredients and simple, basic methods! This salad looks like a winner! Hi Maria, this is a winner in so many ways. First, you always offer great nutritional info – makes one want to run out and get all this stuff. Right now I have everything but the arugula. (Did not know it was an herb!!) I do not like the arugula that’s sold in the typical grocery store, in those plastic containers. I go to a special store – Italian – run by Mario and Luigi – I’m not kidding. Not sure of their source. They bag it and it is always sooooo fresh and tasty. So, will head there soon and make this. Lately I have also been required to minimize acidic food – so many salad dressings on the no-no list – so dressing this with just oil works great – although… I think I’ll mix the oil with a bit of maple syrup… Salad as candy – yaya! Mario and Luigi… I love it!!! Pears, walnuts, and cheese, a beautiful and classic combo, Maria! So delicious. Thank you for sharing. Perfect appetizer ! Perfect ! Thank you !